Rush is still distributing beer; however, by 1907 he has switched to Pabst Blue Ribbon beer, and it is from an ad for this beer that we get a clue as to the location of his bottling works which of course is claimed to be on Washington Street. (4) I’m not exactly sure where on Washington he was located; however, in the 1923 Bristol City directory there is a Warehouse listed under the name Rush Bottling Works at 33 Washington Ave.(1) This building is vacant according to the Dec. 1907 Sanborn map so the mystery continues. So why is it that a successful businessman, and prominent political personage, would end up disappearing under mysterious circumstances around 1910? That was the fate of Milton H. Rush, who disappeared leaving a considerable balance in a local bank which was discovered many years later by his widow. (2) Did it have anything to do with an altercation with a local policeman named Lewis, who Rush knocked down after Lewis insulted him, at the local train depot? (2) Lewis' response was to draw his gun firing a shot at Rush which ultimately missed him. (2) We may never be sure what became of Rush, but maybe someday this nearly forgotten local mystery will be solved. 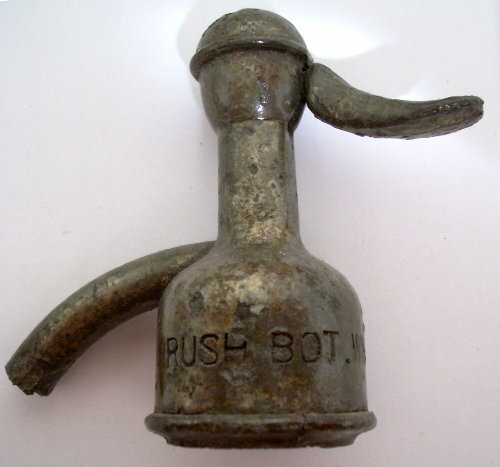 Spout from a Rush Bottling Works seltzer bottle.